They may be made of hydrated silica, sometimes containing up to 20% water, but opals sure aren’t watered-down! These flashing, fiery October birthstones are highly valued both for their exquisite beauty and their fantastically diverse range appearances. Opals were even considered the penultimate gemstone by ancients such as Pliny the Elder, who lauded them for the belief that they were composed from bits of every other type of precious gem. 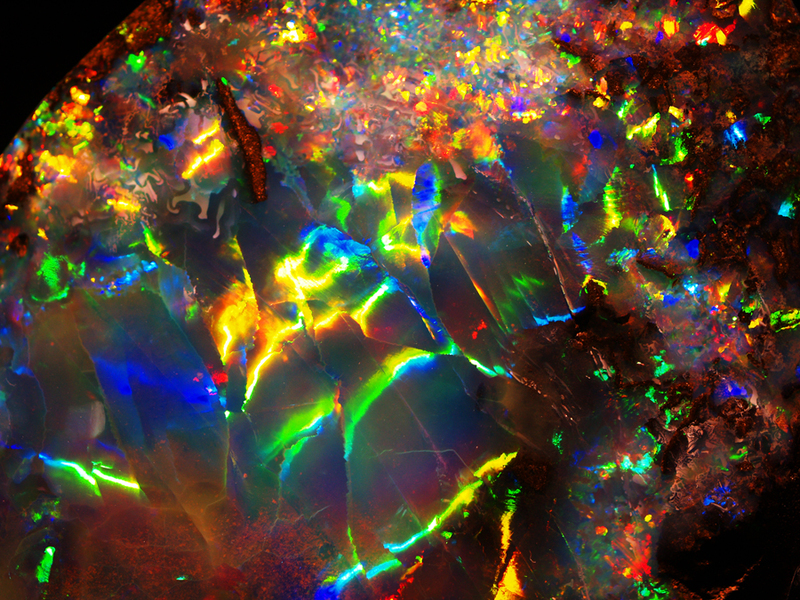 This kaleidoscopic array of color can often be seen in the form of “fire,” or floating shards of visible colors varied and splendid, suspended within the translucent body of each opal. These fractured colors come to be when lightwaves pass through the infinitesimally tiny spheres that make up the structure of the mineral opal. Opals are relatively soft gemstones; about 5.5-6 on the Mohs Hardness Scale, and should be treated with care as much as worn with pride. If you are lucky enough to own this shimmering gem, we recommend keeping it away from harsh cleaning chemicals, and opting instead to clean it with water and a soft-bristled brush. Bezel-set opals, and opals worn as earrings and necklaces are also fantastic ways to keep your precious gem away from hard knocks. 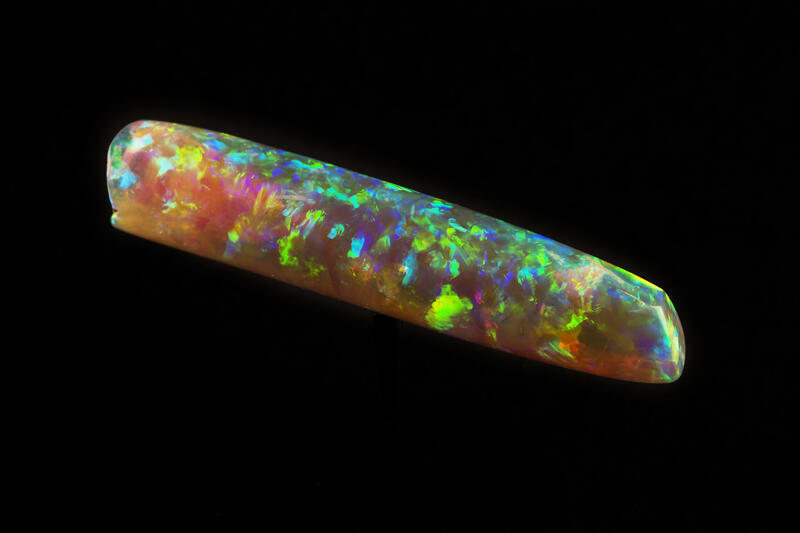 The Virgin Rainbow, the world’s finest opal, recently made headlines upon its discovery in Australia. 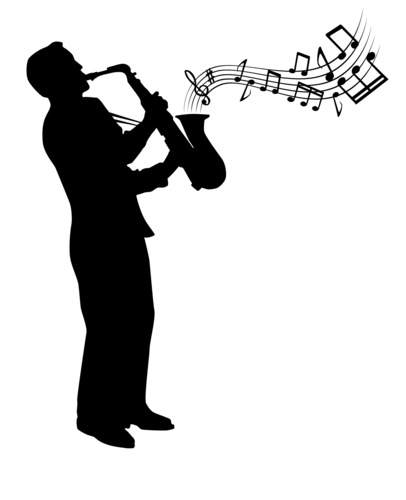 It was ultimately valued at over one million dollars for its exquisitely lustrous fire that the discoverer, John Dunstan, claims can even glow in the dark! Now that’s an illuminating ore.
Are you living with a gemophobe? Maybe a husband or son who thinks that all precious stones are just hunks of sparkly rock meant to be locked away in a jewelry box or behind a plate of glass in a museum? That person might say that gems can never be fun. Well, that person (despite all odds) has probably not been watching enough TV! Some other minor characters include, but are not limited to, Peridot, Lapis Lazuli, and Jasper. 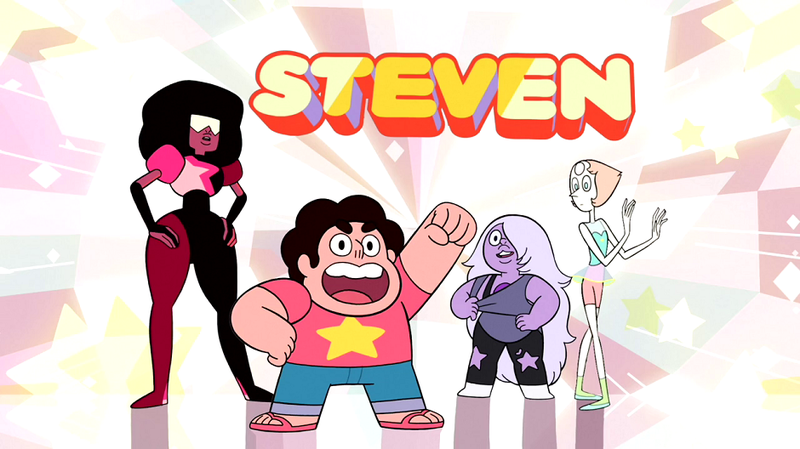 Arguably some of the most fun moments on the show also feature the creation of “gem fusions,” in which two gems will fuse together to create a larger, more powerful gem, which have gone by the names of Malachite, Sugilite (voiced by Nicki Mnaj), Opal, Alexandrite and more. Now, for your gem nay-sayer, these are gems that would simply refuse to stay put in a dusty jewelry box. These gems are made for fighting, and that’s just what they do…by battling invading aliens, defeating giant monsters, swimming through lava, and saving Steven from the occasional misadventure…enough to keep the most critical mineral mope satisfied. It makes a very promising first step to convincing them that gemstones really CAN be fun (especially when you can wear them! )…or, at the very least, it will keep them occupied while you get to sneak away to enjoy the array of Eve’s glittering, and wearable, gems here at the gallery. Q: How did your trip to Pompeii make you feel? A: There’s no other place in the world where 2,000 years doesn’t seem to matter. Through the tragic occurrence of a volcanic eruption and the miraculous discovery of a buried city 1,700 years later, we’re able to see and feel what life there was like. When you’re there you can actually see it very easily…suddenly, something happens, and second sight occurs. A dogs’ dish on the floor, a lost sandal, humble things of everyday…things you immediately recognize, that become very real. Pompeii does that for you. Q: How did these feelings motivate you to create this series? A: If you want to evoke it…how do we do that? One way is to appropriate: to reproduce what people had or did in those days. But obviously, there’s no point doing it exactly alike. It’s going to be tinged with ‘today’ in some way. So, it has to be filtered through my impression, my sensibility…but my intent is to give you some jewelry that you would have worn if you had been Claudia or Flavia or someone in Pompeii at the time. But the other thing that occurs to you there is that you become really gripped by what time has done, and it’s especially poignant there because things are so well preserved…and yet, with two thousand years and the elements…they’ve had some effects. So what you see, the sum total, is very, very strongly emotional. You see the first part: a tempus fugit. The carpe diem, that’s the other conclusion. You feel happy for those people, that they had such wonderful lives. 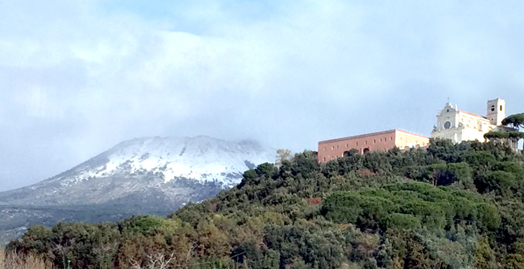 Pompeii was actually a resort; that’s where rich Romans went. They were relaxed. A: So these two Latin sayings are actually the two sides of the collection. They will look different. One is the carpe diem, the part about “seizing the day,” about “living the life.” And life in Pompeii was a very rich life. People were there to relax, to enjoy life, to show off. They built magnificent houses; the frescoes were amazing, and the mosaics were incredible. So we have a picture of life lived to the utmost– and that’s the carpe diem. But over 2,000 years have passed, and what time has created is different. It’s not so much the fact that many things are ruined…it’s the beauty in how time has affected things, how time has ruined them. It’s how we are affected by seeing this decay. I think it’s a very powerful thing: it’s the flag of time, the tempus fugit. Q: What can we expect to see stylistically in this series? Any stones of note? A: There will be some things that perhaps Pompeii would not have seen. Maybe black diamonds were very rare, or occasional there, more than they are now. But in the second part, one of the pieces of shorthand that I’ve used (as the Romans did) are intaglios and carved figures. For these, the designs will often be negatives, not positives. They will be shown in reverse, because we are going backwards through time from the present. They will be seen through other gems, because that is what one sees: you see things through a glass. There will be a number of pieces like this: where antiquity is present, but not directly. You’ll see it a remove or two…one remove is by seeing only the reverse of the scenes, the other one is in seeing them through a barrier. There will be the gems of antiquity, the emeralds and the rubies. There will be moonstones, which I chose because they are like a crystal ball…you can see into them, but you’re not sure what you see, and I like them for that. There will be some gems in the tempus fugit half which we did not discover until modern times…opals, tourmalines…they were later gems. We’ll use those to mark the time that has elapsed since then. I like opals because the colors are evanescent: they change with your point of view. Q: How does this series fit into your work as a whole? A: Something I’ve dealt with in a lot of my series is the fact of our mortality and how we choose to see that time is fleeting: that the hourglass is not going to reverse itself. I’m very conscious of being just a speck on the march of the ants through history, and I think there’s a great beauty in fulfilling that role, in being part of destiny, in actually watching time flow with our own eyes. That is something I like to celebrate rather than fear. And so, maybe half of the jewels you will see in the serie s are about tempus fugit. They are meant to be somewhat nostalgic, to evoke perhaps faded colors, but colors of great poetry, of great sensitivity. And that is the difficulty: how do you reconcile the two?…You can only do it by keeping them separate. So, the series will actually have two components, and I would very much like for people to understand that the first ones, the ones that recreate ancient life, will be perhaps easier to comprehend. But please: stay and watch the others, and I think after a time, that their beauty will seize you as well. A fascinating and optimistic time in history when music, art, architecture and society took on a transformation of unconventional ideas while maintaining a sense of elegance. We’re drawn to the breathtaking time of excitement and hopefulness wanting to explore for ourselves these wonderful delicacies. Music was electric and captivated our senses. Everyone knew of Gershwin, Cole Porter and Maurice Ravel. But it was French entertainers like Ada “Bricktop” Smith and the great Josephine Baker who performed nightly to Paris audiences. When Jazz arrived, it was overwhelmingly accepted by the Parisians. It allowed people like Josephine Baker to become a star. Inspirational developments included Art Deco design and architecture. 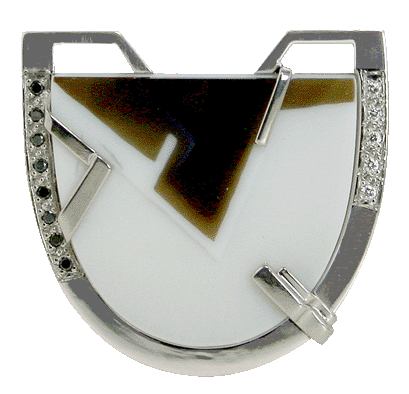 The Art Deco aesthetic was wonderfully sleek and streamlined with symmetrical and geometric designs. It’s character was seen in everything from furniture, fashion to jewelry. As a society, the sense of excitement came from freedoms of individuality such as hand holding, free flowing dresses and beautiful jewelry. It gave permission to define who you want to be. Watch a wonderful video of France in the 1920’s. 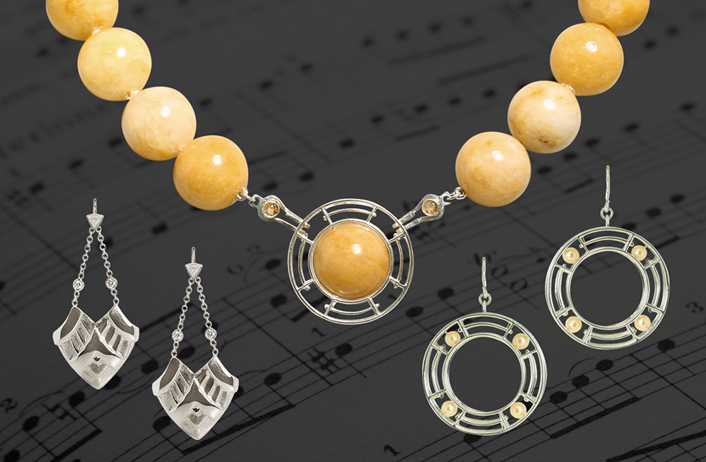 Welcome to Eve J Alfille Gallery & Studio’s new jewelry series, “Jazz Age”. Take a moment to explore the thoughts, inspirations and creations of the Artist’s Statement. In French schools, the recent past is not taught: too fresh to be history, it may revive controversy. So my high school classes learned all about Versailles and the Baroque style, but nothing about Art Deco, or jazz. Though ‘The Jazz Age’ usually denotes a period in the late 1920’s, its great innovations in style extended long past the 1929 crash. The elegance of Art Deco, coupled with its practicality and relative simplicity, “suggesting better times”, still speaks to us today. We revere the elegance of this style: ever modern, it can be treated sumptuously with rare materials, like the inlaid Jean Dunand screen I almost bought in Switzerland in 1981, when we spent a couple of years in Geneva, and my mother-in-law’s diamond brooch. But it had also formed a background of our growing years in its more humble interpretations, the facades of the movie theaters in our small towns, the old Philco radios with the pleated wood cases, the streamline toasters of our early years. I love the functionality, the stylishness: Art Deco is above all a way of seeing, it looks at the pure geometry of everyday objects, the sun, fountains, ocean liners, the pyramids, and translates them into flat decorative motifs that are at once restrained and joyous! For me, what inspired my current Jazz Age series is the particular duality of the style: how it makes room for both movement and repose, exuberance and severity, inspiration from current times and times past. What other decorative style can throw together speedy trains and ancient pyramids, maybe both in the same piece? In this series, I have to remind myself to proceed past restraint: it’s permitted to be joyous, even with nothing but the black, white and gray diamonds and pearls! And no problem letting rubies in, just remember to color within the lines! So we will work from both ends, the pastels of moonstones, Ceylon sapphires and opals, and the glorious reds, oranges and yellows of jades, citrines, topaz and rubies. I design, hearing the jazz of Coltrane and Davis, the coolness and the splendor alternating. White gold and palladium for coolness, blush gold for delicacy, all are playing a role in my new Jazz Age series.